1M will be used as an additional target group to track over the next 2 years. Further 1st year groups may be added also. The current group are in 3rd year and improvements in fractions are likely due to maths work as opposed to numeracy strategies so a new group to work with could yield more accurate results. However testing can still be carried out on the 3rd years. This has been a success with students from the TY Numeracy group creating imaginative posters on how Numeracy is used in everyday life. This will continue next year with a new group. Posters on problem solving have also been added. This will happen again next year as it was a success. It consisted of treasure hunts, guess the number of sweets in the jar and other fun games. This is going being trialled with selected 2nd year groups next year and I believe it is being taught in TY too. Further ideas on promoting progress in our objectives will be collated by team members. Reference was made to some successful team teaching initiatives from the Literacy group. An email will be sent to staff as soon as we get back in September as a refresher on our targets and how they could be achieved in each subject area. Testing in May 2015 has varied shown progress in all 3 target areas. We have succeeded in achieving our target of improving proficiency in dividing fractions with the target group. The latest score was 47%. Given that we started quite low (21%) this is a significant improvement but 47% is still low in absolute terms and can be improved further. We have achieved a 22% improvement but still have not reached our goal of 28% improvement from 2015 to present. There has been a 4% improvement but have not reached our target of 23% improvement from 2015 to present. When looking at our progress to date it is important to look at the SSE key steps. As of 27 January 2017, we are currently implementing and monitoring our improvement plan. This document will be added to as further steps are taken and progress is made. A list of our current priorities are on the last page of this document. Presentation to staff at staff meetings including powerpoint. Emphasis is on how every teacher is responsible for promoting numeracy in their own subject and to actively attempt to find ways to highlight it. 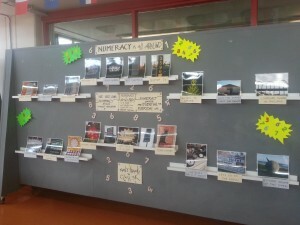 The Numeracy Board. Various subject departments contributed numeracy related visual material such as graphs and charts and these were displayed. The numeracy board is being replaced and in the meantime some info from the BT Young Scientist competition has been put up in its place. In Jan 2015 we analysed the evidence and identified key strengths and areas for improvement. We then compiled our SSE Report and 3 year School Improvement Plan. In the SSE we prioritised our strengths and areas for development and our SIP then outlined what targets we set to maintain our strengths and improve in areas for development. I will now outline each target area in detail and give details on the actions and how we have tracked progress of our targets. To gain quantitative and qualitative data, we established a focus group of approximately 30 students from 1st year in 2014. These were and will be used to collect data year on year to compare like with like. Fractions initiative undertaken with the whole first year group in December 2015. Each first year group was given one class period where they were given a test on dividing fractions, they were then retaught division of fractions and the test was redone. – In the teach/test fractions initiative all classes showed significant improvement from pre testing to post testing. Overall proficiency in fractions has risen by an average of 9% from 2015 to 2016. This comprises of 20 students. The other ten only completed one of the two tests so no comparison was available. We have made good progress but not met our target of 20% improvement by June 2016. – Sheila has reported high interest in the daily puzzle in the library. – The focus group were given a survey in 2015 with various questions about problem solving. They have not been retested yet. We need to retest the focus group on the subject of problem solving, in particular reference to our target. The focus group were given a survey in 2015 with various questions about checking answers. They have not been retested yet. We need to retest the focus group on the subject of checking of work, in particular reference to our target. To gain data on progress in targets further testing of our focus group is needed. Paul and Darren are looking after this late January. This is under construction and will be put in D corridor asap. There will be a grand opening in Numeracy Week. This will promote numeracy awareness and give information and promote discussion on our 3 targets. Exciting themes that have potential to get the attention of students will be explored, such as aviation and fantasy football leagues. A trip to the airport could be arranged. Puzzles can also be put on the board with prizes on offer. Numeracy week is to promote awareness and improve results of our targets. It has been a while since Numeracy has been to the fore and this will remind everyone again. We will try to be as imaginative as possible with activities. Numeracy is a key element of our plans to improve teaching and learning in PCS. Efforts have been taking place in the school to increase awareness of our use of numeracy in everyday life (see display below by class 3K 2014/15) and how numeracy is not just maths, which is a common misconception Numeracy is across ALL subject areas and is a vital life skill. We have outlined a number of priority areas that require development over the next year. Below we will outline our targets for the 2015/2016 academic year and give advice on how students can be facilitated in developing in these areas. There will be many school initiatives but students and parents can enhance this development at home also through using the links below for each target. Students generally can have difficulties in problem solving. This is an essential life skill. We aim to equip students with multiple cross-curricular tools to tackle these problems. Examples of this include drawing a diagram, eliminating possibilities and looking for patterns. There will be a section of the journal in 2015/2016 dedicated to problem solving. It is important that students check their work and verify that they are correct. Presentation of work is also vital. This is relevant to all subject areas. We aim to increase the number of students that review their work prior to submitting it. Many of our students have expressed difficulties in this area. We aim to improve student understanding and application of this topic. Game ideas to encourage numeracy;. Selection of old fashioned games at 3 for 2 offer at 3.99euro each. Snakes and Ladders, Battleship, Pinball,Balancing chairs, Shaky Tower game. May not be directly about numbers but promotes strategic thinking, hand eye coordination and a bit of forward planning. Also can give a good feel for real world phenomena like centre of gravity, balance etc. Math dice and Math dice Junior. @ 9.99euro A dice game that require arithmetic skills. Produced byThinkfun who have a very good wedsite Thinkfun.com with a good selection of games both physical and online, with a section for teachers. Mainly targeting younger students and special needs. Suduko Rubics Cube for under 10 euro. Headspace. A lateral thinking boardgame @ 9.99euro. I also looked at a web site Thinkingtoys.ie. They had Brainbox Maths and Time Tables Lotto board games which may be suitable. They mostly cater for younger students. Their maths games deal mainly with subtraction and addition problems.